Wrong place, wrong time. This is something that we all have experienced at least once and that's what we call a bad spell. The problem is that Ben Hope has the habit of bad spells. Scott Mariani brings back one of the most explosive action thriller heroes in a new adventure that will grab you from the first page, so be prepared for overnight if you read it. Masada is about to be smashed by the Romans and the top men of the city know that their fate is written and is not on their side. The sacred sword must be hidden before the end comes. As usual, everything that hides will be found some day... maybe after almost two thousand years... never is too late! Ben Hope will meet old friends when attending to give a speech for the organization his passed-away wife founded. Simeon Arundel and his wife Michaela are more than happy to take Ben for a few days at home, after all, it is not nice to spend Christmas alone and this is the moment when former Major Hope will get involved, once more, in serious problems. Improvised weapons weren't too abundant in the home of a country vicar. Simeon is a well known and respected vicar and his reputation as a very active worker for the Church is well deserved. He goes and comes everyday visiting parishes, giving speeches and interviews. But something is going wrong, one if his best friends has died in very odd circumstances and the obvious suicide looks like staged. Soon he will share the same luck along with Michaela and Ben will face for first time a new group of enemies under struggling conditions. From there, the plot will lead us to the Holy Land, USA and the Naples. 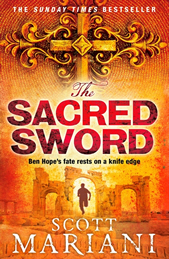 Secret societies, a psychopath, a bunch of murders, a teenager, a taxi driver in Masada and, of course, Ben's beloved Brooke will turn this plot in a big mess where only the former SAS will need more than good luck to keep alive. Keep and eye on: the description of the locations, the reactions of the antagonistic character, Penrose, that are written in a very theatrical way; and of course the explosive elements that compose the narrative of the plot. Scott Mariani is by far, one of the very best on action thrillers. We thought that 'The Shadow Project' was the last adventure for Ben Hope and Mr. Mariani surprised us with 'The Lost Relic' taking our hero to a next level and now, Major Hope will not only satisfy our hunger of action but who knows... maybe will show some hints of a new era and new series to come.